How we modernized a heritage juice brand to earn awareness for busy parents in an increasingly crowded beverage arena. Apple & Eve is the maker of the #1 juice box in the U.S. and comes with 40 years of brand history. But in recent years, the shelf-stable juice & drinks category has grown increasingly more competitive. As shelf space with retailers has decreased, the number of products in the category has only expanded, with many products touting similar messaging. Apple & Eve enlisted AMP Agency to build a distinct brand platform that would authentically connect with its key audience – busy moms and dads – and help them stand out in crowded field, ultimately leading to greater brand awareness and sales lift. Here’s how we developed a new brand platform and campaign to distinguish Apple & Eve in the category and establish them as the go-to family favorite for good-for-you juices. Over the last decade, the juice category has declined year over year. With retailers reducing space in the shelf-stable juice aisle and new players entering the market at an unprecedented rate, Apple & Eve found itself competing against other newer brands with similar messaging around taste, convenience, and price. Our task at hand: bring Apple & Eve’s distinct product offering and wholesome values to the right audience through a fresh and fruitful new brand platform. AMP took a deep dive into audience insights for our core target, the Nurturer Mom. We discovered that this audience is driven by affirmation that she’s doing a good job as a parent, we aimed to establish Apple & Eve as the preferred juice option—as the brand that understands her values and purpose as a mom and why providing her family with the best is so important. To reach her in the most effective and strategic way, we analyzed her user habits and digital behavior, and found that she spends most of her online time on a smartphone or tablet. She’s most likely to respond and recall ad formats that include: Online audio (Pandora, Spotify, podcasts), email, mobile apps, video, social, and Influencer/blogs/word-of-mouth. We also learned that Nurturer Moms are willing to spend more and to prioritize quality over price when it comes to maintaining their lifestyle and keeping their families healthy and happy. Deeply researching her online habits allowed us to develop a creative campaign and supporting media plan that was highly relevant to her as a consumer. A new integrated brand campaign aiming to drive awareness of the brand and reach the desired audience in more targeted, strategic manner and establishing a seamless digital journey to take the consumer from online to the store. Every new day is a new opportunity for parents to squeeze in as much play, health, laughter, and goodness possible—just like Apple & Eve does with every product they make. Bringing the brand to the masses meant creating a modern, clean and family-friendly website experience, where visitors could more easily find product descriptions and store locations. The site also served to bring Apple & Eve’s wholesome, trusted brand to the forefront, highlighting their tradition of bringing goodness to the table since 1975. This meaningfully connected Apple & Eve’s heritage with their newest offerings. We drove our evergreen social to a custom developed content hub that hosts recipe and craft content, adding value for busy parents. We intentionally brought the site and social experiences together to create a space for parents to seamlessly explore value-first instead of brand-first content. We knew that parents coming from social to explore recipes and instructions would spend more time on site and engage with us, instead of losing them with brand promotions. To bring the campaign to life, we developed a series of brand videos to run across paid social, pre-roll, and programmatic. Centered around imagination and the limitless potential that each day holds for a child, we blended animation with live action. We took inspiration from the watercolor aesthetic of Apple & Eve’s packaging. Each video thematically showcased different product lines. We used social copy variations to appropriately dial up brand communication and/or product benefits, depending on the audience for the ad and the platform. Ultimately video was the most effective performance driver for the campaign, increasing both national awareness and engagement. To create campaign efficiencies, we adapted video assets to be programmatically served as static and HTML5 rich banner ads. Our audience data showed the Nurturer Mom is most active on her mobile device, so we prioritized targeting her with mobile-first messaging. These ads were delivered based on her habits and digital behavior, ensuring the ads would appear on properties relevant to her online activity and interests, like Parenting.com and Foodnetwork.com. Social sampling program Influenster allows for strategic and custom-targeted sampling, product feedback, and social media posts from an engaged community of consumers. 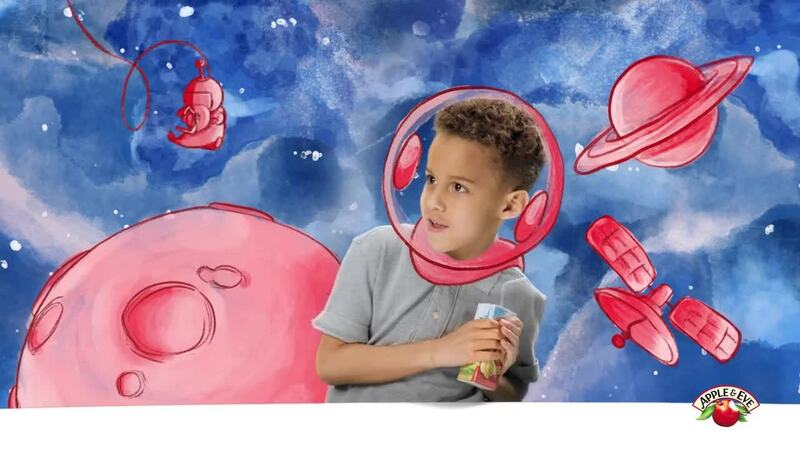 We engaged Influenster as a partner to not only introduce Apple & Eve juice boxes to thousands of new consumers, but also to bring the brand millions of impressions through social posts from participants in the program. While digital efforts drove awareness, we needed a way to effectively get consumers into the store and drive trial. Mobile coupon programs run through iBotta and Checkout 51 proved incredibly effective, especially because we found through audience research that the Nurturer Mom audience often uses their phone at shelf to make purchasing decisions. Coupon programs for Apple & Eve a Day exceeded all benchmarks and helped drive 80,000+ direct sales. Establishing Apple & Eve as a digital-forward brand with unique positioning in a crowded category helped the brand obtain new distribution, drive to sales in-store, and most importantly create an authentic dialogue between brand and customer.